Since time immemorial man has dreamt about the moon. It is our closest astronomical body, second only to the sun in brightness. Forty years ago, on 20th July 1969, the US astronaut Neil A Armstrong stepped off the lunar module Eagle onto the Sea of Tranquility. Man's greatest adventure was launched at the peak of the cold war as a way of achieving superiority over the USSR. It was a joint effort by over 400, 000 people and of course the US taxpayer who footed the $24 billion bill. There were three astronauts on Apollo 11. 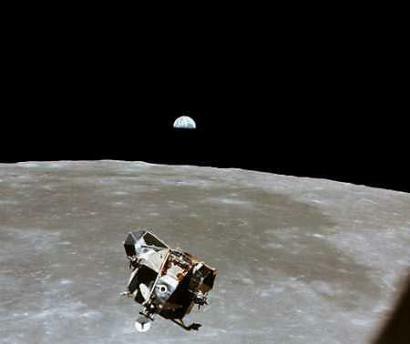 Neil Armstrong and Buzz Aldrin landed on the moon in the lunar module 'Eagle' while Michael Collins orbited the moon in the command module 'Columbia'. The Saturn V rocket was the brainchild of Wernher von Braun who had designed the V2 rocket for Nazi Germany. James Webb was the NASA administrator. He was not a scientist or an engineer but he managed to steer the project to completion and to secure the funding. But, it was one man, John F Kennedy who was ultimately responsible for mankind's greatest adventure. There have been 126861 visitors (356528 hits) on this page!